Please find below our educational video library explaining the different components of retirement. Each video is two to five minutes each. This presentation will review the basics of stocks. We will go over the basic asset classes, the different investment styles, different company sizes and lastly the geography of the different classes available. This presentation will review the basics of bonds. We will define a bond, discuss the asset classes, and lastly review the types of bonds available. This presentation will go over the advantages of making salary deferrals to your 401(k) retirement plan. 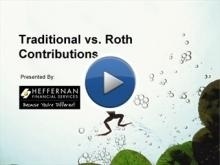 This presentation will explain the difference between Traditional and Roth contributions. It will also provide you with a few considerations when choosing which method is best for you.